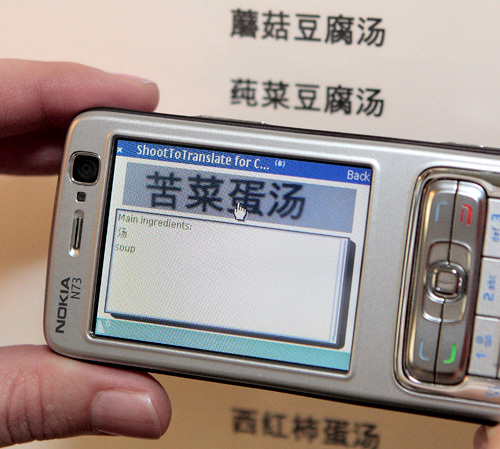 Nokia's Shoot-To-Translate Application | OhGizmo! While it was announced back in October at their “The Way We Live Next” event in Finland, Nokia was actually showing off their Shoot-to-Translate mobile phone application at CTIA this year. The program is able to translate Chinese to English by simply taking a photo of the text to be converted. Unfortunately there’s not much else known about the app, including how it works and if it will support other languages, if and when it’s ever released. In fact it could just be a technology demo for all we know, so hopefully Nokia will release some more substantial info about it. And I wasn’t aware that ‘soup’ can actually be considered an ingredient. Maybe the example text used in that photo is a recipe on how to make a boring dinner.